Steve Jobs is a name well known in the computing, cellular, technology, and marketing fields. He was a visionary and the companies he founded and worked for (Apple and Pixar) are notable successes. A key element that made Jobs a success was his focus on design that extended all the way from company products to the Apple Store itself. He was focused on every detail, no matter how minor, and there's much you can learn from his ideas. Design in POS and point of purchase displays covers a lot of different areas. When working with a client it can be difficult to translate their general ideas into a specific design concept. Keep these two concepts in minds form and function a successful design is going to have elements of both. Form is a more visual aspect as in what form is a display going to take. This can range from the practical to the attention getting but no matter what form a display has it should tie into a display's overall goal. Function is the more mundane (but essential) aspects of design such as display durability, weight, overall strength, and size. Jobs was well known for controlling every aspect of his company’s design philosophy. This resulted in a singular concept that was notable for its simplicity, lack of clutter, and uniformity. Apple Stores are an excellent example of this design philosophy applied to the retail setting. Apple Stores are notable because they don’t display prices, place the items front and centre, and use a minimalistic design that doesn’t distract from what they are trying to sell. There are two key things you can learn from Steve Jobs in relation to POS and POP displays. One, don’t let the display overshadow the product itself. See pictures of an Apple Store in Birmingham here. The sales displays while certainly well made sit in the background as your eyes are pulled to the items for sale. This is very important because a display is meant to be an accent piece to a product and promote the product itself. Aside from not allowing the display itself to overshadow the product also design the display to compliment the product. Second, Jobs was well known for personally using company prototypes and returning them for redesign when he noticed flaws. This is important because he put himself in the shoes of a customer and looked at things from their point of view. Learn when to step back and perceive how a customer will view your displays and what their response may be. 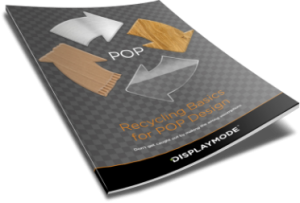 DisplayMode can help with the design process in creating a display that effectively promotes a product and has an appropriate form and function. DisplayMode’s innovative reflex end of arm graphic holders are one such example of their expertise. Designing a POS display that not only meets a customer's needs but is also well designed is difficult and what a customer wants can be hard to conceptualise. However, DisplayMode can assist with all the details (no matter how small) that come up in the design process and help create a display your clients will love.